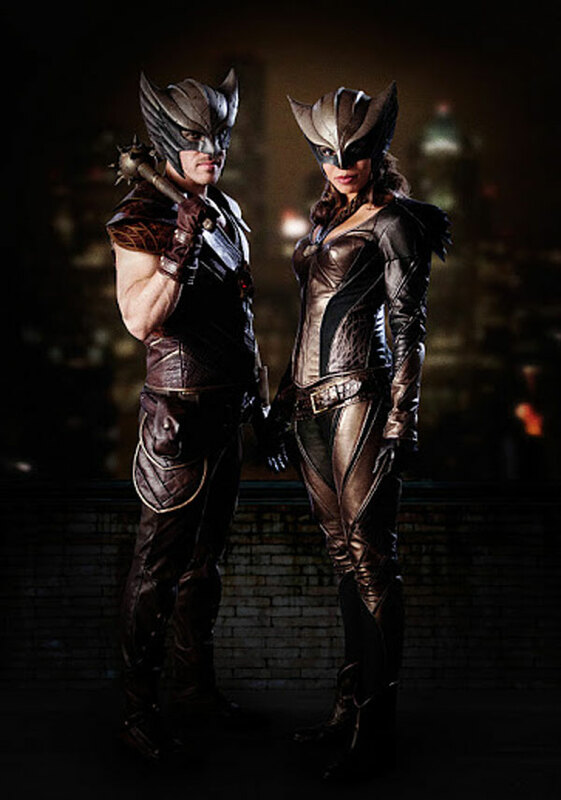 It’s going to be a while before Legends of Tomorrow premieres on the CW, but this morning, the network released the first official image of Hawkgirl and Hawkman, and they look pretty fierce. You can give the sleek suits, wild helmets and interesting weaponry a look, below. Legends of Tomorrow isn’t expected to air on the CW until midseason, but we’ve already seen a little bit about what to expect from the series, thanks to an exhilarating trailer released this past spring. In the trailer, we got to see a little bit from Ciara Renee, who will be playing Hawkgirl a.k.a Kendra Saunders on the series, but at the time, she was decidedly without the suit. It’s exciting to see the character all geared up. Hawkman was added to the series a whole lot later; the show signed on Falk Hentschel to play Carter Hall a.k.a Hawkman at the beginning of August. Then, just a few weeks ago, we learned the character will actually be a series regular on Legends of Tomorrow, along with Renee’s Hawkgirl. The two are Egyptian lovers that have been romantically entertwined for 5,000 years, a fact that Carter Hall will remember and Kendra Saunders will not at the beginning of the series. Should make for some pretty odd squabbles. Although Legends of Tomorrow is a ways away, we will get to see several of the characters on the upcoming series early. Legends villain Vandal Savage will debut in the second big Arrow and Flash crossover that will hit the schedule later this year. Hawkgirl and Hawkman are also expected to be introduced through the other CW-produced DC TV shows before the new series becomes a reality. Here’s what else we know about the drama. Legends of Tomorrow will feature a full ensemble cast, also full of characters we have seen on Arrow and The Flash before. Along with Hawkgirl, the Legends team also includes The Atom, White Canary, Captain Cold, Heat Wave, Martin Stein, Rip Hunter and Jay Jackson. You can see them in action, below. Legends of Tomorrow will air on the CW starting in 2016. For now, you can catch The Flash and Arrow on Tuesday, October 6 and Wednesday, October 7, respectively. In addition, here’s when the rest of your fall favorites are returning.